With our eye toward safety and our extensive knowledge of the electrical code Absolute Best Electric can provide you with a detailed safely report in which we will prioritize the items that need attention from the immediate, to those that can safely be deferred until a later time. We can also check for harmful levels of EMF emitted from electrical power supplies. GFCI stands for ground-fault circuit interrupter. It is an electrical outlet that responds to an electrical threat in as little as 1/45th of a second. When a difference of energy is detected the GFCI outlet shuts down the flow of power. These outlets are most commonly found in bathrooms, kitchens, and outdoors. Installing GFCI’s in strategic places throughout your home will help make your home a safer place. 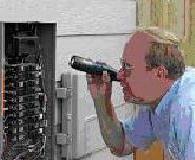 Let Absolute Best Electric inspect your home and make recommendations as to where GFCI placements should be made. The brands we use most are Leviton, Eagle, and Pass Seymour. Whole circuits in your home can be controlled by GFCI type circuit breakers, and ARCI type circuit breakers are now required for bedroom area outlets. Since 1999 Bedroom outlet circuit breakers have been required to be of the AFCI type to prevent fires in the bedroom. They are capable of sensing arc fault, and disrupt the circuit before a fire can start. If your bedrooms do not have these, let Absolute Best Electric explain to you how you may benefit from this newer and safer technology. Check your Smoke Detectors at least monthly. Should you need them changed or some new ones installed, call Absolute Best Electric 818 225 1314.